I have made it out to paint for three consecutive days now! As I mentioned in the last post, my first painting was really too horrible to post at this time. However I have pictures of the last two day's effort. I am going to post today's painting first, in a moment. Yesterday the conditions were perfect for painting. Since it was the Thanksgiving holiday and we have a lot of visitors in town, there was a lot of people on the beach and just as many dogs. I really wanted to concentrate on my painting so I kept my head down and didn't make eye contact so only one person came up to chat. There were people climbing on the rocks behind me and then sitting a while to watch. I didn't mind. I just didn't want my concentration to be disturbed. Today's weather was completely different. Pretty typical for the Northern Oregon Coast. I headed out with my gear even though it was raining. The winds were light. I have a plein air umbrella that clamps to my setup which keeps off either the sun or the rain. It doesn't do so well in wind, let alone both rain and wind. The weather was calmer on the north end of the beach. It was actually fairly warm due to the warm front moving through. I hike from my house which is about a mile and a half, mostly along the beach. I figure it is a good way to get some exercise in. I had to secure part of the umbrella to my tripod with a bungie cord. Thankfully I carry some with me! The day was very gray and rainy with a lot of mist. I had to continually grab the umbrella when any large sets of waves would come in. The wind they produced threatened to knock my setup over. I painted for about 2 hours when I began to realize the weather had changed. The wind shifted and the temperature dropped. I rushed to get the painting as finished as I could and then packed up to hike home. The wind had picked up so much the rain stung my face and I had to keep my head down and lean into the wind as I walked. © 2012 R.L. 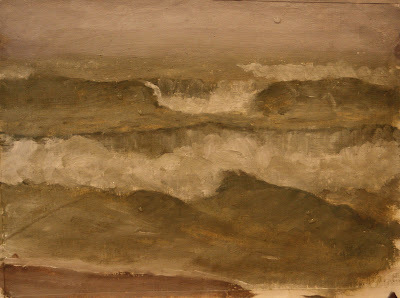 Delight, The Day After, plein air wave study, 6"x8" oil on hemp canvas. You can still see some water drops. The umbrella kept most of the water off but not all. The foreground is not finished. I will probably finish it in the studio later on today. Here is yesterday's. As you can see, quite a different day even though it was overcast too. © 2012, R.L. 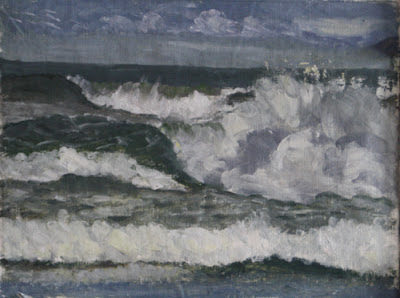 Delight, Home for the Holiday, plein air wave study, 6"x8", oil on hemp canvas. The color on the first picture is close but slightly off due to the fact that the day is so dark that I had to turn on a light in order to get a photo. I would reshoot it if it was a formal painting. On a final note, I am going to have to replace my old rain gear with honest to goodness foul-weather gear. Today was warm (about 58 degrees) but being as wet as I was could be dangerous when it is colder. My boots have cracks in them and my feet get quite wet. I never can seem to find waterproof boots that will last a whole year before starting to crack. I have even tried more expensive ones. If anyone has any suggestions please leave a comment! Take care everyone. There is some serious energy moving around with planets aligning and a lunar eclipse, not to mention solar storms! Beautiful waves! Please stay warm. 58 degrees seems cold when wet. Thanks Katherine! Yes being wet here is a concern. I knew I could get home fairly soon even so, I got a lecture from my husband and am ordering new boots. Until I have the proper gear to stay dry enough, I will paint from the car on days like yesterday. I wanted to try though and figured it was better to try while it was relatively warm. I am loving plein air painting but I also love staying healthy so I can paint!